FedEx – The World on time. Disneyland Resort – Where dreams come true. IBM – Solutions fro a small planet. Campbell’s – Mmm mmm good! 1. Share your commitment. What is your company devoted to providing for it’s customers? 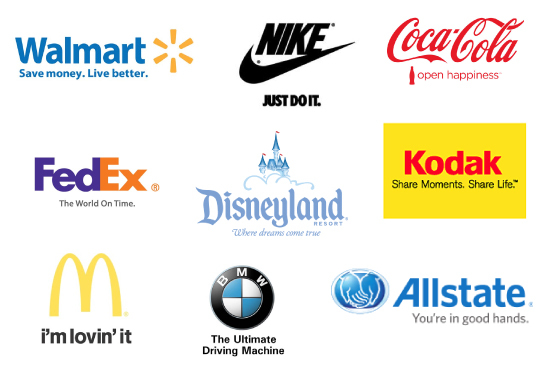 Use your slogan to show why your brand can be trusted. This is a great way to stand out against other brands that provide the same type of products and services. 2. Keep it short and sweet. Keep your tagline simple. A tagline should not go over one full sentence. As we see listed above a catchy tagline can be as little as one or two words. 3. Make it fun. If it is suiting to your brand make your slogan fun. You can also make it a jingle to make it easily remembered. One of the most popular taglines is from Energizer. Who could forget the bunny who “keeps going and going and going”? 4. Highlight what makes your company different. Your slogan should state what is unusual about your brand or something that is not standard to your competitors. 5. Be honest. When you write your tagline it is important to reflect your brand honestly and accurately. Are you really “number 1” or “the very best”? Be realistic. A good example is Visa’s tagline: “It’s everywhere you want to be”. Visa’s tagline emphasizes the company’s advantage in a clever but real way. What catchy taglines and slogans can you recall? Do you have a tagline for your brand? What do you think makes a memorable slogan? This entry was posted in Brand Awareness, Branding and tagged brand, Catchy Taglines and Slogans, slogan, tagline. Bookmark the permalink. Arleen, I have an Etsy shop and this post has got me thinking about a catchy tagline. Really like that idea because in everyone of the above, just reading the tagline you know who it’s about. Lenie- Having a catchy tagline will make you stand out. I am still thinking about a catchy one for myself. In the meantime I have used for years my dachshund and people remember me because of the dog on website. I’ve always loved the Energizer slogan. As I looked at your list I realize I want to make mine shorter than it is. I appreciate the tips! Patricia- There are many times I think of the bunny and then the brand comes to mind. It is a great marketing tool. Your examples show how a few simple words conveys the spirit of a brand. However, coming up with those few simple words is not so easy. Donna- The tagline that works for each person is not easy but can sum up what you do in a simple short description your brand will be remembered. Tag lines are a great topic and so important for a company. All the good ones are great, and hard to follow. But you make good points as to how to tackle them. Essential that their short, but they absolutely have to be fun too. Kathy- As I always say short and sweet and to the point. With so many things vying for our attention , we easily switch off if a slogan does not capture us in some way. When I am waiting for a YouTube video to load and a 5 second advert is played, I quickly turn it off if it does not appeal to me. I notice names of businesses and find some catchy and others too obvious, for example “A cut above the rest” for a hairdressers. Some slogans are catchy, others are too obvious. For example “A cut above the rest” for a hairdressers. If a slogan or advert does not interest me, I easily switch off as I am sure others do. When watching Youtube videos and an advert is shown beforehand, I will leave it to play in full if it captured my attention in some way. Phoenicia recently posted…Delays – what are your coping strategies? Phoenicia- You have a short window to impress your customers or make that statement so a slogan needs to be catchy. Arleen — When taglines work they are great for your brand. But It makes me crazy when I see taglines (even IBM’s) that say they “provide solutions” or “quality.” Those are meaningless terms. What is a solution — why not say what it is? Quality is another overused word. What specifically supports your claim of quality? I like your tagline a lot. Mine is “Profit from Business Writing That Sells.” I think it works but would be interested in your thoughts. Jeannette Paladino recently posted…Can You Give Away Your Content and Still Make Money? Jeannette- I would shorten your tagline. When I read your tagline I am not sure what you are selling. I had to really go through your site to understand what you are selling. Your tagline should draw me to understand immediately what you are selling. Yes IBM’s slogan they provide solutions maybe meaningless however we all want to solutions to our problems. Overused or not it still gets their point across that they are problem solvers. Arleen — thanks for your feedback. I appreciate your taking the time to look through my site. I am going to think about it and see what I can come up with. Yesterday I was trying to come up with a byline or tagline for my new blog. few ideas came to mind, but still wasn’t happy. And then today I land on your blog and see THIS post complete with 5 helpful tips on the topic. Talk about coincidence and serendipity! Kim- I was trying to come up with a catchy slogan and then decided to stick with A Promotional Products Company. It is not catchy but at least you know what I sell without having to figure it out. I go to so many different blog site and I have no idea what they are selling. Great post Arleen. I’ve changed the tagline for my business a few times as I’ve continued to drill down into the niche. There are a gazillion personal growth blogs, books and coaches out there and attempting to rise above the masses and stay true to yourself is pretty challenging. And in my case I write about a subject that many people have a difficult time wrapping their minds around – emotional resilience. But I think I’ve finally settled on the right tagline – building strength from the inside out – and am in the process of updating our marketing materials. It’s a never ending process and I gotta say I love it. Marquita- It is never ending process to fine tune what you are about. Your tagline is powerful and you have done a great job. I wrote an article a couple of years ago about this very thing but I have yet to come up with a slogan or tagline. It’s a tough assignment. I’m going to think about it again. I think I’m a creative person until I run up against a wall like this! Beth- Yes writing a tagline is tough. Why not use “Attracting Your Perfect Client”. I think writing a headline is a creative talent. How about.”Priceless” or “Got Milk”? It’s the brevity and the sound of the word. The sound of word fits the product and the campaign. It was more difficult for me to come up with a tagline than writing 10 blogposts. Timely post–I have been trying to come up with a logo for my Musings site. I think it’s beyond my brain power! I like my tag line well enough. It seems to get to the point. Maybe we should have a separate discussion in the BHB group and get feedback on these things? You are SO right about the catchiness of the tag lines you listed. They stick in your head and are an instant way for people to relate. We always called my Dad the Energizer Bunny. Everyone knew exactly what we meant! Rose- I think taglines and logos are important to all. Now coming up catchy ones is not so easy. Isn’t interesting how we take the slogans and use them to refer in your example to your Dad. We all know what that means. I recently been thinking of making a tag line for my novel, similar to what you would see with a movie, and this information really helps. This is a wonderful post about slogans and taglines. You are right, those are what make the company to stand out. My business motto is “Independence. Balance. Awareness”. It is simple and straight to the point. Being aware of your business goals, it makes it a bit easier to come up with a slogan. Thank you for sharing your wisdom on this topic! Anyways, I completely agree with your points, Writing Catchy Titles and Taglines are important these days, so I appreciate your efforts for giving these tips. Great work.